This book was first published in 1997 in monochrome and A5 Landscape format. This fully revised edition includes new material and, as it is in A4 format with full colour illustrations, aims to provide the reader with a more visual appreciation of the importance of the canal to the industrial development of Carlisle in the early 19th century. It was to be 11½ miles long, 54 feet wide and 8 feet six inches deep and it was to run from Fisher’s Cross near Bowness to Carlisle. In 1820, the Carlisle Ship Canal was to be the economic salvation of the city. Sea going vessels sailed up the Solway Firth, carrying the trade of the city, but they only sailed as far as Sandsfield, and then only when the tides were favourable. The goods were unloaded onto carts and the expensive carriage began. When the ironwork and the retorts for the new gasworks were shipped from Liverpool, it cost twice as much to carry them the three and a half miles into Carlisle than it did to bring them all the way from Liverpool. The price of coal would be halved. Everyone would benefit. Work began in February, 1820. There was work for local men and work for the large number of men drawn to the town. And there was trouble. The bar of the Fox and Grapes was plundered. Sheep were stolen. The blacksmith from Drumburgh stabbed a labourer. Nine months later, the canal was open from Port Carlisle to the basin on Port Road. Eleven sea-going vessels assembled at Burgh. Sailing ships were to be seen from the streets in Carlisle. William Brown painted a picture of seven ships docked in Carlisle. The enterprise promised well. There was a new sense of optimism in the city. There were fears of a shortage of water. Ships had to unload some cargo to have sufficient draught. A new watercourse was cut from Willowholme. By 1837 the canal was beginning to prosper, but the writing was already on the wall. In June, 1838, the Newcastle to Carlisle Railway was open over the whole of its length. A year later, the increase in railway traffic was “truly astonishing”. The Solway tides were always treacherous. There were shipwrecks and accidents, but, more seriously, a sand bar was developing across the mouth of the port. Lord Lonsdale had built a jetty at Ravensbank to protect his land. This had reduced the sweep of the tide. In April, 1852, the Canal Committee resolved: “that it appears highly desirable nnd expedient that the Carlisle Canal should be converted into a railway with as little delay as possible.” The water was drained from “the silent highway” and construction of the railway began. When the railway viaduct was built across the Solway in 1865, it was the end of Port Carlisle. David Ramshaw has written a blow by blow account of the rise and fall of one of Carlisle’s great economic enterprises. It is a story that touches on the lives of the ordinary citizen as it much as it does on the lives of the entrepreneurs, industrialists and financiers of a thriving Victorian city. 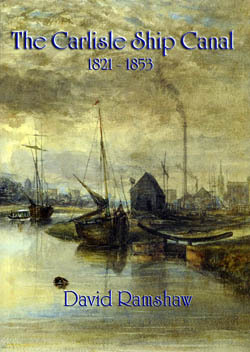 David has considerably augmented his earlier book on the Carlisle Canal and reprinted it in a larger format, which displays the copious range of photographs, paintings and maps to greater advantage.